5 PICKS FOR THE COLD WEATHER. Kicking off today’s proceedings is somewhat of a my favourite – the chunky roll neck jumper. The roll neck has made a real comeback as of late and after putting down its roots last year, the look is set to come to fruition this time around. The chunky knit will always keep you warm, whether utilised on its own or under a piece of outerwear for the days when the frost is really biting. Worn alone, a roll neck can work as a statement piece due to its tactile nature and sheer weight. It also doubles up as a great layering option, especially when incorporated into looks focusing on an après-ski aesthetic. Hopefully you won’t need to be busting out the blockbuster coats or parkas just yet. However, pairing this essential simply with on-point denim, boots and boot socks – rolling up/tucking in your trousers for brief glimpse of sock – begins to really spell out your style credentials. If you are unfortunate enough to be experiencing a particularly cold snap, a duffle coat adheres to the rugged nature of the look and is a perfect choice to layer over the top. Designed to help you blend in, ironically camo print is more likely to help you standout and make a statement this season. Camouflage has been a contentious issue over the past few months – you either love it or hate – but the fact remains that it will certainly be sticking around for seasons to come, as more and more retailers begin to pick it up. With the trend not entirely in full swing, now is a great time to get on board and get ahead of the game. Incorporating the print through subtle details (shoes, pocket squares, ties or even trouser and cuff turn-ups) is an inventive way of working the trend without being too full on. On the other hand, a bold pair of camo chinos is surprisingly easy to work with and look great when paired alongside the basics up top. Alternatively, channel some of the ‘Woost’and work camo into your tailoring – blazers in the print have been propping up rather regularly as of late and keep the look sharp yet casual. 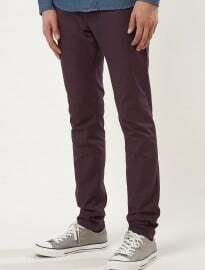 As mentioned above, camouflage chinos can be deceptively easy to wear and work as a real statement. Just remember to tone everything else down and treat camouflage as a colour as well as a print. A white shirt, navy double-breasted blazer and brown Chelsea boots fitted around the chinos creates a great individual look and is a rather sophisticated take on the trend. The broadest of our essentials, the humble sweatshirt is another classic that has made a comeback within recent seasons and is now cemented firmly in our wardrobes. Worn under a causal-orientated blazer, over a shirt or louchely with chinos – the simple sweatshirt is versatile, comfortable and here to stay. Colour has observably played a key part in menswear for a number of seasons now and this change has been reflected collection after collection, in both the high street and high fashion circles. A topic of a recent article of mine; coloured trousers are great for injecting vibrancy and showing some personality within your cold weather outfits. Coloured trousers are a particularly potent autumn/winter weapon. Avoid the traditional seasonal shift in attitude by ignoring the temptation to allow darker, more muted hues reign supreme September through March. Introducing a block of colour alongside the monochromecreates a striking statement that will bring something different to the average winter look. Rose coloured chinos present a bold choice to wear without being too brash. Alongside a denim shirt and neutral cable knit, the pairing brings a presence of masculinity to the pink while the tassel loafers complete the look with a little class. Depending on the weather, you may want to add some socks rather than going barefoot, in which case something neutral such as navy would help keep things low key while also tying the top half to the bottom, figuratively speaking of course. Whether it’s fur, colour, print or just sheer stature, a blockbuster coat should be a priority on your list of items to aquire for autumn/winter. Shearling collars have been incorporated onto many outerwear styles for AW12 and not only do they help to keep you warm, they also add a little extra character and texture to your coat. Rich, burgundy toned outerwear looks sharp and sophisticated against black – with boots and jeans all too happy to oblige. A dark grey roll neck finishes off the theme of metropolitan sophistication and keeps the look on-trend while exuding an element of timelessness.